These Three Tasty Recipes for Pumpkin Spice Oatmeal feature steel-cut oats cooked overnight in the slow cooker or quickly in an Instant Pot. These are recipes for a delicious pumpkin spice oatmeal breakfast everyone will love to wake up to! Click here to PIN Three Tasty Recipes for Pumpkin Spice Oatmeal! Click here for The Best Slow Cooker or Instant Pot Recipes for Steel Cut Oats! Definitely both oatmeal and pumpkin qualify as a Friday Favorites pick, and here are some recipes for all the pumpkin and oatmeal fans out there! We’ve updated this post to create a collection of Three Tasty Recipes for Pumpkin Spice Oatmeal. If you’re one of those grocery shoppers who stocks up on canned pumpkin the first time it goes on sale, this recipe is for you. These recipes are all made with steel cut oats, canned pumpkin puree and spices and you can pick a recipe for the slow cooker or the Instant Pot. Pumpkin Spice Oatmeal sounds perfect when you are looking for something good to have for breakfast! Pressure Cooker Pumpkin Pie Steel Cut Oats from Noshtastic are great for a fall breakfast. And pressure cooker oatmeal is healthy and delicious! With just five ingredients, Pumpkin Spice Oatmeal in the Crock Pot from Weelicious, is an easy and tasty way to start your morning. Instant Pot Pumpkin Pie Steel Cut Oatmeal from 365 Days of Slow Cooking is perfect for a chilly fall morning! This is easy and quick to make and so tasty to start your morning. Use the Index Page for Breakfast to see all the slow cooker or pressure cooker breakfast recipes that have been featured on this site. Just wondering why these recipes can't be stored on ZipList? I'm finding it a handy tool! 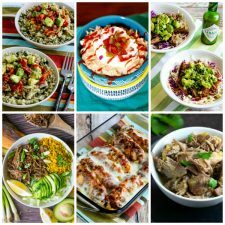 I can't pub Ziplist on this blog because the recipes are not on here, but many of these bloggers have it on their site, so when you click through to get the recipe you can add it to Ziplist from the original site. I'm sure not all of them have Ziplist, but they're mostly bloggers I know, and I think about 3/4 of them have it. Ugh. that should say "I can't put" not I can't pub.